This shortened version of our 14-day culture itinerary covers the three most important urban hubs of China, both in the modern day and in ancient history. Throughout this 10-day exploration, students will have the chance to examine the intersectionality of culture, history, demography and how it all fits into China’s modern reinvention. Each of the 3 destinations on the trip is a unique cultural hub: Shanghai, the world’s most populated metropolis, Xian, the starting point of the Silk Road, and Beijing, China’s political centre. Our school trips are completely customizable and can be tailored to meet your requirements. Additional destinations available for this theme include Shaolin, Inner Mongolia, Guizhou, Chengdu, Guilin, Guangzhou, Hong Kong, and Yunnan. Speak to a specialist now to find out more. Arrive and transfer into the city. With a GDP higher than double the national average and a life expectancy higher than that of the UK, Shanghai is one of the world’s most developed cities. After checking in, students go on a walking tour of People’s Square & Nanjing Road where, every day, one million people shop and upwards of a billion RMB (1,000,000,000,000) changes hands. We then go to the world’s biggest Starbucks! This roastery not only delivers its famous coffee but also some history and insight into how they make their signature blends (drinks not included). We finish the evening with a welcome dinner. We start the day in Old Shanghai to visit the Yu Yuan Gardens and the nearby City God Temple Bazaar to see the local markets in action. Then, for lunch, we tuck into Shanghai’s famous Xiao Long Bao dumplings. Afterwards, we tour Shanghai’s dramatically futuristic financial district, Lujiazui where we head to the top of the Shanghai Tower. 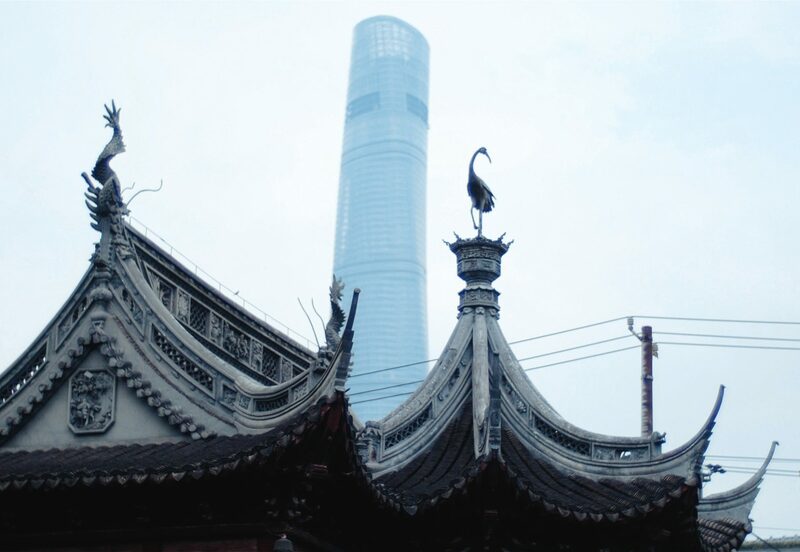 In the evening, our guides explain Shanghai’s colonial history as we walk around The Bund. The day ends with an evening cruise on the Huangpu River alongside this historic district. Today students will be doing a half-day school exchange at a Chinese school,specially matched to meet your educational interests (let us know what they are). Typically this involves a school tour, joining some lessons, playing some sports, eating lunch together and participating in other various activities alongside Chinese students. Your students will be expected to prepare a small speech or performance for the welcoming ceremony beforehand. The next stop is the Shanghai Urban Planning Museum. Shanghai has the highest urban population in the world and this museum explains how they’re all watered, transported, and housed. We catch the night train to our next stop, the Ancient World’s trade capital and mother of the Silk Road – Xi’an. Arrive in Xi’an and drive outside the city towards the Terracotta Warriors. One the world’s most mysterious necropolises (just 1% of the whole complex has been excavated!) and a scientific marvel (ask our specialists about the worksheets we have available for this visit). After checking into our accommodation, we go to Xi’an’s historic Muslim Quarter market with all its sights and sounds. This is where the traders from across the Silk Road first settled in China. Students will sample the unique flavours of Hui Muslim foodbefore finishing the day with an evening stroll to see the Drum and Bell tower lit up at night. Our first stop is at the Great Wild Goose Pagoda: deemed a UNESCO World Heritage Site for its religious and architectural significance. Then, we go to a local museum for an authentic calligraphy lesson. 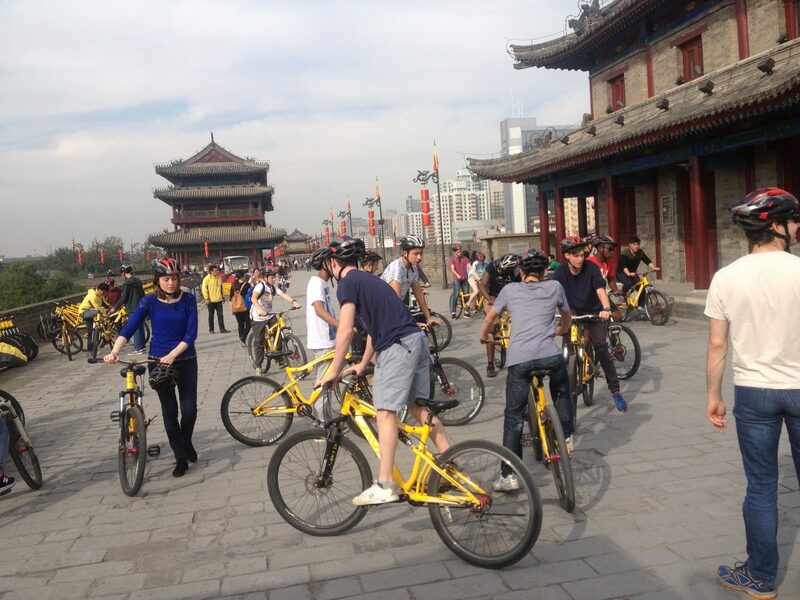 In the afternoon, we do the absolute must in Xi’an; the bike ride around the top of Xi’an’s ancient City Walls. They are China’s best-preserved city fortifications and an excellent way to compare and contrast the old historic city with the soaring skyscrapers of modern Xi’an. Board the night train headed for China’s sprawling capital – the largest city in the world – Beijing. In the morning we visit the Summer Palace and its temple complexes. Walk through the grounds and then take a wooden boat across the palatial lake (boat only available April – October). Then, students will be testing their bargaining skills at the Pearl Market – one of China’s famed ‘fake markets’ for souvenirs and other knick-knacks to bring home (ask our specialist about our Pearl Market Scavenger Hunt). We finish the day by trying different Chinese delicacies at the Wangfujing Night Market. The first activity today is a Kungfu lesson in a local spot popular with Tai chi practitioners. After an intense morning, students will relax with some sightseeing at the Temple of Heaven. Originally where the emperor participated in religious rites, the complex is a stupendous feat of classic imperial Chinese architecture and was thus named a UNESCO World Heritage Site. After a tour, students engage in a traditional tea ceremony at a park within. Finally, we visit Tiananmen Square, the Forbidden City, and Jingshan Park for a panoramic view of no less than three World UNESCO heritage sites. In the morning, we go back in time as we travel to a secluded and incredibly beautiful section of the Great Wall while avoiding the crowds. Students will do a hike whilst learning about the how the Great Wall has influenced China historically & geographically. Upon returning to the city we finish the evening with an acrobatic and theatrical performance show. Our first stop today is the National Olympic Stadium, also known as the Bird’s Nest – it was the site of the 2008 Olympics and will be used again during the 2022 Winter Olympics. Go to the top for a ‘bird’s eye’ view. Then, students will be led on a guided tour through Beijing’s Hutongs – the old alleyways that have served as local neighborhoods since the 1200s. Next, we visit the Lama Temple, Beijing’s most iconic bastion of Tibetan Buddhism. Our guides explain the differences between Tibetan Buddhism and the more commonly practiced Han Buddhism. Then, we move to the Confucius templewhich was built in the 1300s to honor Confucius. We finish our trip with Hot Pot, a traditional boiling, fragrant broth used for self-cooking an assortment of meats and vegetables. A China must-try! We say goodbye to our guides and trip leaders and transfer to the airport. Apply what we’ve learned from our experiences here back at home. Students come face to face with no less than 7 UNESCO World Heritage sites including the Terracotta Warriors, the Great Wall and the Forbidden City. Experience the contrasts between urban and rural, modern, and ancient as well as the different customs & cultures of the north and south. 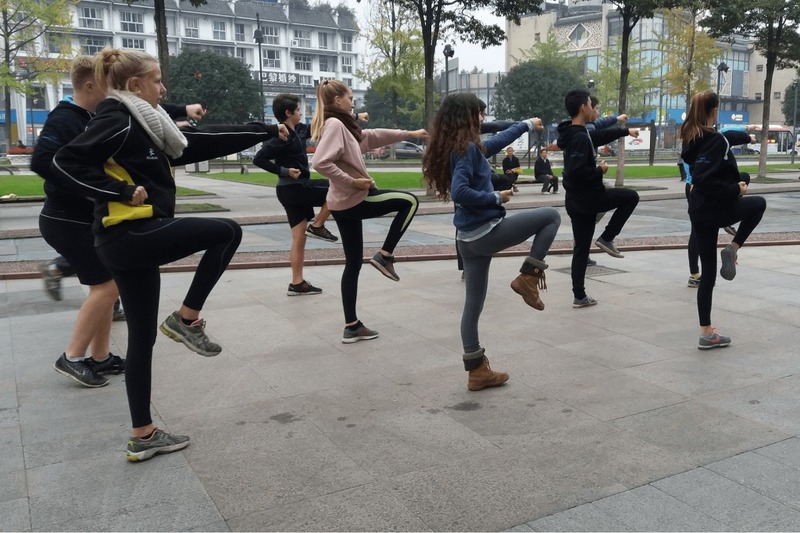 Engaging in Kungfu, cooking, and calligraphy lessons as well as tea ceremonies and hikes guarantee in-depth experiential learning.